Stefan Molyneux, well known anarcho-capitalist host of Freedomain Radio, is also an advocate of atheism. He’s the author of Against the Gods? A Concise Guide to Atheism and Agnosticism. I decided to write a critique of this book. Such a critique is not entirely necessary (I hope), but I’ve done it anyway, since it is well within my abilities. Against the Gods? is written in Molyneux’s signature style—a confused mixture of good points and terrible ones. The primary purpose of the book is to refute agnosticism. I’m no fan of agnosticism, nor do I wish to defend it, but Molyneux has not achieved his goal at all. He set up a straw man and set fire to it. He does a good job of setting fire to it, but it’s just a straw man. Between the poles of strong atheism and strict theism lies agnosticism, the argument that gods are very unlikely, but cannot logically be ruled out as utterly impossible. I don’t think that’s the correct definition. Read the entry on agnosticism in the Stanford Encyclopedia of Philosophy. Not one of the possible definitions given ressembled Molyneux’s—that an agnostic must be one who leans heavily toward atheism. Furthermore, Molyneux abandons his here-given definition for most of his book, instead regarding agnostics as those who agree that gods are logically impossible, but remain neutral anyway. What a flammable straw man! According to Molyneux, agnostics say that gods, though logically impossible, may exist in another dimension or universe, and we thus can’t say that gods certainly don’t exist. I don’t know many agnostics, and I haven’t discussed agnosticism with many people (1? ), but this doesn’t sound like a real position. Much of his book is about refuting the above position. I won’t cover these parts. He spends the first of the chapter complaining about the word "atheism" and its definition. These are inherently biased terms and definitions, he says. Believe it or not, this is where the title of the book comes from. He complains that atheists are said to be “against the gods” as if they have something personal against gods, when they don’t. He chose this as his title. Actually, I think Molyneux does have some personal reasons for rejecting theism. Most atheists feel the need to replace God with a Leviathan state. Molyneux, on the other hand, hates authority, so he rejects both God and state. Two main errors are generally made when examining the existence of gods. “Gods cannot logically exist” is a basic fact, apparently. Will Molyneux show us this obvious truth? He’ll try. Also notice that second error. Is it really that common? How does Molyneux disprove God? He offers four arguments. The first time I read these, I laughed. These are the worst four atheistic arguments against God I’ve ever heard. What’s more, he offers little to no defence of them. Nor does he provide references for further evaluation of these arguments. Has nobody told Molyneux that biology is the study of Earth's living things, and doesn't apply to non-physical beings? Has nobody told him that God was not created by reproduction, but exists by the necessity of his own nature? Furthermore, God is not actually complex. He’s simple, in that he has maximal values for all objective qualities. His thoughts may be complex, but he is not. He has no moving parts. Except that consciousness is not an effect of matter. Quite the opposite: consciousness is an effect of the spirit, and cannot exist without it. Thus, materialism is impossible. Molyneux gives no evidence that consciousness is an effect of matter. There’s even an argument from consciousness, which argues for God’s existence using the non-physicality of consciousness. I will grant Molyneux that this is the best of his arguments, but I still don’t think it’s good. Those things which God knows will happen tomorrow are caused by God himself. Consider a person whom we’ll call Philemon. Philemon knows what he’ll do tomorrow. He’s sure of it, and he’s right. Does this mean that his knowledge restricts his power? Of course not! Again, Molyneux is wrong and doesn’t provide any reason to believe he’s right. A thing can exist without being detectable. In any case, God is detectable. That’s what the teleological argument’s all about, and that’s what Plantinga’s epistemology is all about. On page 34 Molyneux says that the idea of gods existed before arguments for gods did, so belief in god cannot be justified. This is both genetic fallacy and chronological snobbery. Also, if God communicated directly with humans, as the Bible says, then they obviously had good reason to believe (not to mention Plantinga’s epistemology). On page 39, he presents a list of supposed theistic absurdities. Straw man. Rather, that which began to exist need have been created. Even if we take his above argument (#3) to be sound, he has not established that they are both impossible. He has only established that they cannot coexist. That’s Calvinism. Don’t pretend we all believe it. I don’t think even Calvinists believe this. If a religion is proven true, the individual doctrines needn’t all be independently proven. Also, why must they be “empirically” proven? 1 A deity must exist (call him “Jeb”). 2 Jeb must have the interest and power to interfere in the universe. to interfere in human affairs. members of a particular sect. give money to his priests – and ideally, punish said folks. Point 8 doesn’t belong on the list. That’s essentially all there is to Molyneux’s book. At some point in the future, I may cover his Universally Preferable Behaviour. Stefan's problem is his understanding of omniscience. A god who predetermines everything cannot really be all powerful, but predetermination isn't necessary for omniscience. Predetermination assumes no free will beings, and actually no free will at all for anyone other than the god. If there is free will, there is no predetermination, which most Calvinists would agree with. However, we if we do have free will, how could God be Omniscient? He is because He knows every possible outcome of every decision by every free will being in every situation. He would have to know the possible outcome of every decision in all our lives, and how they would all shape the future like The Butterfly Effect. That's actually quite a bit more impressive if you think about it, as it requires an infinitely greater degree of knowledge. He is still Omnipotent, however, because He still has the power to intervene as and when He sees fit. This does imply that humans do not have unrestricted free will, however. But really, the very idea of miracles means that we don't have unrestricted free will. Overall, from the quotes you posted, it looks like Stefan has a specific idea of a god that he doesn't believe in. It's not the concept itself, it is his understanding of the Christian God. I suspect he has a negative history with Christianity, or people calling themselves Christian, or his misunderstandings of what was being said. Did you get the impression from the book that he had any knowledge of, or beef with any other major religion, like Islam, or Hinduism? I’m sure you would’ve been able to read it. It’s free as a PDF and isn’t long for a book. I read it in an hour or less. I link to it at the top of my review. I’m not sure your response to argument 3 tackles exactly the problem he’s proposing. He’s saying that God’s omniscience limits God’s own actions. The real problem, I think, with his argument, is that the effects of that which God plans to do are already in his knowledge. Free will and omniscience is a different problem. You are right to say that foreknowledge doesn’t mean predestination. There is one form of predestination that’s compatible with free will, and I think it’s very probably true. It’s called Molinism. You might want to look into it. 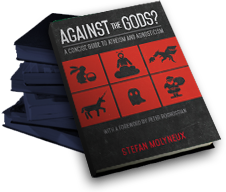 The impression I got from the book was that Molyneux thinks all gods are basically the same. I guess he’s more familiar with the Judeo-Christian concept of God, so he characterized all gods in that way. I don’t watch his YouTube stuff much, but I think that (at least recently) Molyneux regards Christianity as mostly good, and Islam as bad. This is part of his defence of Western Civilization. Well, I might actually read it if it's free and not that long! I think my solution has room to accommodate his objections. If God knows every possible action we could all possibly choose to take, He can know what He plans to do in each of those situations as well. I may not be being strictly logical here, but I do try to fit what the Bible teaches about God into my thinking. It seems pretty clearly taught in the Bible that there are times when God changes His mind, and God can change His mind because of human prayer, then it must be assumed that He knew what He would do if one thing happened, and He knew what He would do if the other happened, yet He didn't actually know which one of the two courses of action He would take until the man, as a free will being, made his choice and acted. I hope that's not too convoluted to follow. I have heard of Molinism, through William Lane Craig, and it is interesting, but for me ultimately unconvincing. As I understand it, and as explained by WLC above, God knows what every free will being will do in any given circumstance. This doesn't really make sense to me because in the Bible, God is constantly warning people, specifically the Israelites, that if they don't repent of some thing, then some judgment will fall upon them. If God knew in advance that the Israelites were not going to heed His warnings and would then face judgment (think Babylonian exile), then His warnings seem ineffectual, calling into question His omnipotence, or intentionally ineffectual, calling into question His goodness and honesty. I think it more likely that if humanity had any free will at all, then there is in some sense things that God cannot know. He cannot know them because they are logically impossible. Omnipotence means God can do all things logically possible, so too does omniscience mean that God knows all things logically possible to know. God can no more make a stone so heavy that He can't lift it then He can know what a free will being will do in any circumstance for sure. He can know every possible choice, and every possible outcome, but it seems logically inconsistent to say He can know what a free will being will do before he does it. After saying all that, I think I did misunderstand Stefan's argument the first time. After re-reading a few times, I think my answer is a lot shorter. Gad can still know what will happen in the future for certainty because He knows what He will do. If He knows the future and He knows what He will do, so that any change He makes He intended to make, and He knew He would make them. Thanks for the enjoyable conversation. I see no reason to think that knowing a free person’s future actions is logically impossible. God knows such things from the fact that he knows the future, not because he’s making any prediction based on clues. God can warn people of possible consequences, despite knowing what will happen, because, despite his foreknowledge, such people are free to choose. Well, it really is a problem that only relates to God as the Creator, and it is tied to the idea of free will. It seems to me that since God is the Creator, if He creates a person the way they are knowing what they will eventually do, then He per-determines their actions, and as such they do not have free will at all. Since He creates everyone and everything, you can't really blame nature either. God would have made Adam knowing he would eat the apple He told him not to eat. That makes God the originator of sin, and it destroys the idea of free will. Even we fallible humans understand this. We exert more effort to convince a family member not to drive while obviously intoxicated than we exert to convince them not to lie. Both are wrong, but only one of them is usually an immediate physical danger, and you're just not going to let the one happen if you can physically stop it, while the other you will continue to try to convince them of but with less urgency. God is more powerful and more wise than us, so His warnings are much better. However, if God knows how a person will react to His warnings for sure, He surely must know how much more convincing He needs to be to get the job done. If He is all powerful He should be able to do it. If He can and chooses not to then it calls His goodness into question, doesn't it? I don't see how this avoids the idea that God is responsible for their bad choices, since He made then, knew how they would behave, and gave what He knew to be an inadequate warning to stop them. There are a few other things I wanted to put in the critique, but forgot to.